Aarhus, Denmark’s second most populous city, will see the introduction of a new harbor bath designed by our friends at Bjarke Ingels Group (BIG), who have designed other harbor baths in Denmark, which beggars the question of what that is: Copenhagen’s Harbour Baths, such as BIG’s Islands Brygge (2003), are recreational swimming facilities constructed along a waterfront, falling conceptually somewhere between a dock designated for people to hang out around and a man-made beach. In 2007, the International Olympic Committee recognized the first BIG harbor bath with an honorable mention for Best Public Recreational Facility. 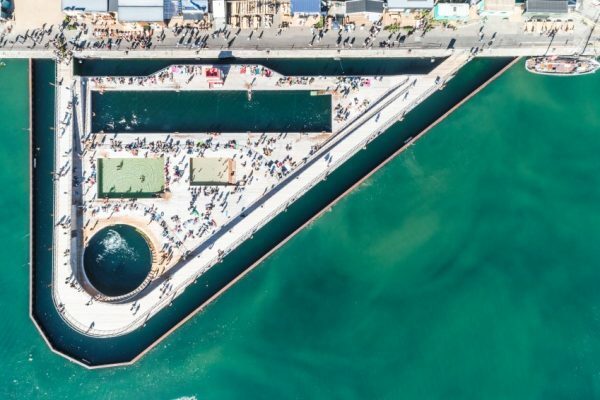 The Aarhus Harbor Bath opened last month and comprises three pools of varying depths for swimming and diving; these include a 164′ lap pool. A supplementary project, now under construction, is AARhus, designed by BIG in collaboration with another Danish firm, Gehl Architects: a mixed-use development adjacent to/associated with the Bath.